April 16, 2017 – “More” hits the Amazon Kindle Best Seller list in several categories! 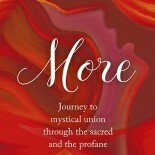 More is a daring and inspirational memoir offering the reader the opportunity to experience the potential for healing and enlightenment from the inside out as you go with Mariah on a journey of self-discovery that begins when she and her husband participate in my yearlong Love and Ecstasy Training. Mariah’s memoir offers a ray of light both to individuals and to couples. Her work will appeal to a large audience. More is just as the title promises. It is much more than a journey of a woman and man finding healing through sexual intimacy, orgasmic pleasure and sensual adventure, all of which it includes. It is the journey of a human spirit moving to inner peace with herself so she can find divine union with another. It is more than a self-help book. MORE is a book of transcendence that speaks to all people as we attempt to rise above our fears and traumas to our higher selves. I heartily endorse Mariah’s story of her spiritual journey. It has all the features that make a compelling spiritual autobiography as well as those that make a touching love story. There is soul-searching despair and its transcendence as well as heart-wrenching desire and its fulfillment. Mariah and her husband have committed themselves to the spiritual path as well as to each other with commendable tenacity. And the juicy bits are sure to turn the properly prudish red with embarrassment or perhaps green with envy. I highly recommend this book to anyone trying to balance busy lives with meditation practice, and especially to anyone seeking to heal from sexual trauma and transform their lives in the pursuit of highest Love. Here is a bold celebration of holy intimacy and its capacity to heal. Kudos to McKenzie for her courage to share this story!